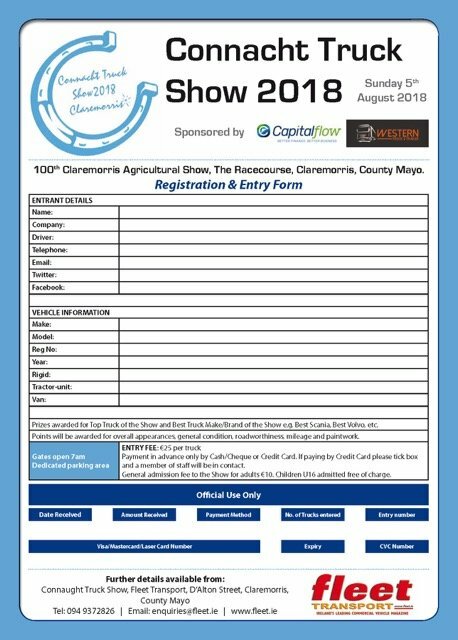 A large gathering of truck owners, drivers and commercial vehicle dealers will add to the spectacle at the 100th Claremorris Agricultural Show as the old Racecourse venue also hosts the inaugural Connacht Truck Show on the same day, Sunday 5 August, in association with Capitalflow and Western Truck & Trailer Parts (Claremorris). To date the event has attracted huge interest from the road transport fraternity across the province and beyond, with some bookings from hauliers crossing the Irish Sea to proudly display their working and vintage trucks in the west. “A special dedicated parking area for the associated trade stands and display trucks has been allocated at the venue with a separate entrance for the exhibitors, which will be open from 7 a.m. on the Sunday for the one-day event,” explained Jarlath Sweeney, Fleet Transport on behalf of the organising committee. “Interested parties are urged to register in advance of the event in order to assure entry – open to tractor-units and rigids only,” advised Jarlath. For trade exhibit queries, please contact enquries@fleet.ie. Tel: 094 9372826.